Download our 'Introduction to Self Building' eBook! Whether you’ve always wanted to build your own home or the idea has only just come to you recently – now couldn’t be a better time to get your Self Build plans underway. 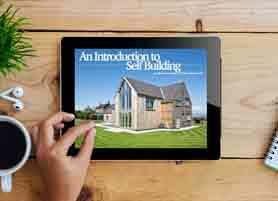 AC Architects have produced a fantastic eBook that we would like to share with you so that you fully understand what a Self Build project entails, and what the benefits of Self Building are. Allan Corfield Architects Limited will use the information you provide on this form to contact you to provide you with Self Build knowledge and inspiration as well as updates regarding Allan Corfield Architects Limited. Your information will be stored solely on MailChimp and will not be passed to any third party. Please pick 'Yes, I want to receive the ACA Newsletter' if you would like to hear from us via email. With guest contributions from some of the industry’s main players, such as Homebuilding & Renovating’s Michael Holmes, this free resource is ideal for getting to grips with the early aspects of Self Building. If you’re thinking about starting a Self Build project, or your project is in its early stages, ACA’s free ‘Introduction to Self Building’ eBook is for you!